My predecessors started the shop situated next to the Shepherd & Dog as shoemakers in the year 1825-26. They took it as a cottage and dug the rock away and built the shop part. That was my great grandfather (Willett) and then my grandfather (Edward Willett) learned the same trade and carried it on there and his wife baked their own bread and started baking for a few others with hers. Presently it got to 20 top 25 loaves a day and a small bakehouse was added with wood oven and bread made from a ‘comp’ prepared with yeast (collected from Poynings Brewery) and potato water . It was from that start that grocery etc. grew and my father (Obadiah Lucas) married a Miss Willett (Rhoda) and together built the business up. 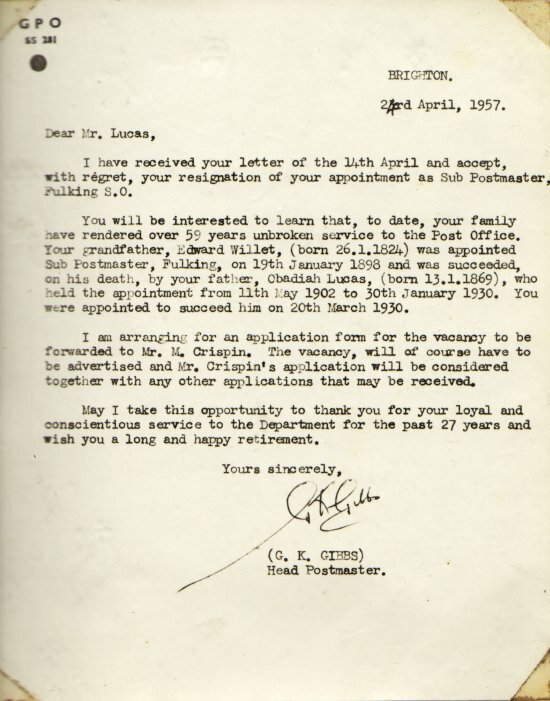 A Post Office was found to be necessary and my father was first postmaster. When the present premises became vacant about 50 years ago, they were acquired and we moved in bringing the Post Office with us and the present proprietor (P.W. Lucas) then about 12 months old. My grandfather (Mr. E. Willett) died in 1905 and my father carried on the business until 1920, when he left me to carry on. In 1939 my late son J.W. Lucas (killed in RAF) won a Gold Medal for Hovis bread; and we have also been awarded Diplomas for ‘Daren’ bread; made by our late baker Mr. Shepherd now of Small Dole and for National Bread made by yours sincerely P.W. Lucas. Next to the Old Farmhouse is the village shop which seems to stock everything. Mr. P.W. 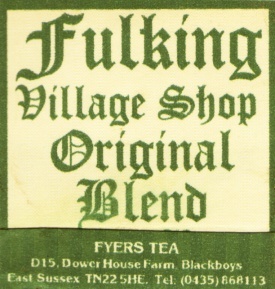 Lucas, the proprietor, knows the wants of Fulking folk. He is a lifelong resident of the village, moving with his family to the present premises from the Old Bakehouse (just above the Shepherd and Dog) at the age of 12 months. Perhaps best described as a grocer’s shop, his is also the bakery (he bakes half the village bread, the other half being sold in the form of sliced, wrapped loaves) and the Post Office, and he is the sub-postmaster. It is good bread that he bakes, too. He and his family are renowned for it and have won awards in widespread competitions. Being the only shop in the village the Post Office has considerable responsibility. From it goes a very wide round of deliveries of groceries and bread. Mr. Lucas himself has many memories of the days before the motor-vehicle made transport as easy as it is today. In those days the nearest means of communication was the now disused railway station on the Dyke. Everything had to be hauled by horse and cart round the tortuous road by Saddlescombe. Footnote: ‘Comp’ is an abbreviation for ‘compound’, a type of barm. This entry was posted in Food & Drink, Local History. Bookmark the permalink.